Despite the challenging economic environment, this 2012 research shows that the leaders in this field are enjoying an increased level of benefit and more return on their efforts than ever. 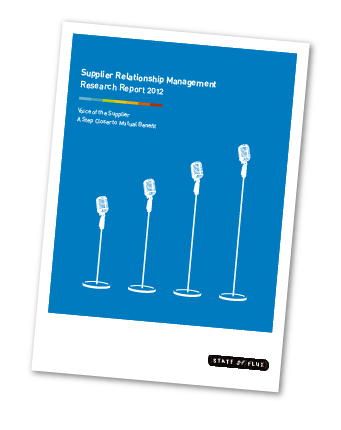 This is the fourth consecutive year we have published this report and for the first time our research has included direct feedback from supplier organisations (SELL SIDE) on their experiences of SRM. This paints an encouraging picture of how, when done well, SRM is starting to deliver mutual benefit. It also indicates that suppliers are well aligned to SRM programmes. The more effort that is put in the more they notice it. Once again our report is structured as an assessment of the current state of SRM followed by a more detailed analysis of the six pillars of SRM we have defined previously (see page 12 for a diagram of the six pillars of SRM). We are confident that achieving excellence in each of the six pillars is necessary to optimise the value and benefits derived from an SRM approach. Despite the difficult economic environment our study indicates that progress is being maintained at a very similar level to previous years. Whilst overall progress continues to be made it is clear that leaders are making more rapid and significant gains. Over half the respondents regarded as leaders are reporting significant progress against less than a fifth of followers. While there is good cause for optimism, significant barriers still need to be overcome if progress is to be maintained. Consistent with our findings of previous years, the two main barriers are: a shortage of people with the right skills and competencies; and a lack of adequate systems support. Uncertainty over how SRM should be defined is being resolved. Organisations are defining SRM more clearly as a collaborative relationship with key strategic suppliers aimed at delivering new joint value. Over half of all respondents identified this as their primary focus. This year’s figures show a very positive trend. Even though the overall proportion of respondents reporting direct cost saving benefit is slightly down, the value of the savings is up. The proportion of leaders reporting savings in excess of 8% has increased. In 2011 this was 20% but by this year the proportion has increased to 40%. This is the clearest indicator that an investment in good practice SRM yields benefits, even for those in the process of developing their approach. Our research indicates a slight change in the profile of benefits being realised. There is a small reduction in the number of businesses seeing SRM deliver direct cost improvement (cost reduction / cost avoidance) although this is still the largest benefit area. There has been an increase in the number of organisations recognising risk reduction as a benefit. Fewer organisations are reporting innovation which is cause for some concern, however more are seeing increased benefits by being a customer of choice. With benefits on the increase the subject of sharing these with suppliers is once again examined. Examples of customers regularly sharing SRM benefits with suppliers remain rare. Only 41% of BUY SIDE respondents occasionally share financial benefits with the SELL SIDE. Like most other activities in the current economic environment SRM is being looked at critically as an investment of time and resources. This puts an even greater emphasis on effective supplier segmentation to ensure that valuable time and resources are allocated to the right supplier relationships. Businesses are increasingly using less traditional segmentation criteria such as value creation potential, technology and innovation, appetite for collaboration etc. Our engagement with SELL SIDE organisations has reinforced our understanding of the customer of choice concept. Our SELL SIDE respondents reported that they provide the following types of benefits to strategic clients: senior management engagement; pro-active improvement; preferential pricing; market knowledge and best resource etc. SRM can only be successful with the ‘permission’ of stakeholders. SRM requires support and resource from three main stakeholder groups: senior internal stakeholders; business units and functions; and suppliers. The survey reveals a clear correlation between the level of stakeholder engagement achieved and the level of effective SRM activity. The numbers show there is still some way to go in order to grow and sustain SRM: 63% of leaders have strong and active senior internal stakeholder support; 67% have broad functional support; and finally 63% have the broad support of their strategic suppliers. Greatly improved stakeholder engagement can be achieved by aligning the SRM value proposition to key business drivers. Stakeholders need to be engaged with this compelling story. A good indicator of stakeholder engagement and support is where SRM has executive sponsorship. Less than half of leaders were able to confirm that accountable executives were in place for their key strategic supplier relationships. What really makes a business-to-business relationship work is a combination of people, process and technology, combined with excellent communication. Without proper governance relationships are subject to the vagaries of individual personalities acting without structure, rigour or consistency. In 2011 strong and effective governance was one of the areas where SRM made the most progress. It is somewhat worrying that this year it doesn’t feature in the top five. Feedback from our survey respondents suggests that many organisations are not putting in place the fundamentals of good practice contract and performance management with their key strategic suppliers. Less than half of the companies we contacted have robust contract and performance management in place with more than 50% of their strategic suppliers. In 2011 our survey indicated that just over five in ten organisations reported that SRM was recognised as a formal business discipline. This year that figure has increased to nearly seven in ten from the total sample. Also in 2011 the preferred organisational design solution for SRM seemed to be split evenly between the role as full time dedicated, managing a portfolio of supplier relationships (26%) and it being positioned in procurement as part of wider category management or sourcing responsibilities (37%). Developments in the last 12 months have seen the preference change to the latter option with the split now 21% and 45% respectively. 2012 shows a significant increase in the use of ‘virtual’ cross-functional teams amongst the leaders compared to 2011. The use of this organisational solution has increased from 64% to 93%. Our research has consistently revealed significant skill gaps and equally an apparent reluctance to invest in training. This situation has shown only a marginal improvement since last year. Still less than 10% of respondents have made a significant investment in training and only just over a third have made a moderate investment. This situation looks different when the leaders’ figures are studied. The survey reveals that 87% of leaders have invested in training to a moderate or significant degree. The biggest gaps can be found in the ‘soft’ skill areas such as crossfunctional working, leadership, change management, trust building, communication and influencing. These are the areas that have been identified by respondents as most in need of improvement. Including SRM in people’s personal objectives has increased. In particular amongst leaders where 100% are now reporting that SRM activities and goals are built into individual personal objectives. It is clear that a lack of IT functionality to support the full range of SRM activities remains an area for further development. Leaders appear to be making more use of IT systems with over nine in ten reporting that they make use of IT. However, the effectiveness of these IT systems in support of SRM is questionable with three quarters of leaders describing it as just adequate. The situation with followers is even worse with over three quarters describing it as poor or very poor. The tools most commonly used to help manage supplier relationships are operational performance scorecards and balanced scorecards. Use of other tools has improved year on year including an increased number of companies employing voice of the supplier and 360 degree relationship assessment surveys. Financial savings remain the most widely used metric. Collaborative measures including innovation and joint working are increasingly being used. The most successful strategic supplier relationships are characterised by openness, trust and a high level of information sharing. This year the focus of information exchange is moving towards sharing more strategic information. Innovation is still seen one of the most important SRM benefits. It is considered once again the biggest source of potential value by 18% of respondents. Whilst consistently ranked in our research as one of the most important benefits of SRM it remains an area of untapped opportunity. The number of respondents reporting benefits from supplier innovation dropped from 42% in 2011 to 35% in 2012. This area remains a real cause for concern. Feedback from respondents indicates that good SRM practice will be rewarded by customer of choice benefits. In order to become a customer of choice it is important to understand what your supplier values from a relationship aside from the obvious financial measures of revenue and profit. This year’s research clearly identifies what it is that supplier organisations value: alignment; trust; brand association; communication; being respected and valued. The proportion of all respondents that say they collaborate with their suppliers 'always' or 'often' has increased, but more notable is the increase in leaders reporting collaboration taking place 'always' or 'often'. This has increased from 80% in 2011 to 93% in 2012. A pattern of steady progress year on year has emerged. So too, have areas of development and opportunity. Most notable, and we would say most within reach is the necessary investment in both people and technology. Our challenge to businesses already embarked on, or thinking of starting an SRM journey is to grasp this opportunity and develop a strategy that has people and technology at its heart.